China's decision to allow all married couples to have two children is driving a surge in demand for fertility treatment among older women, putting heavy pressure on clinics and breaking down past sensitivities, and even shame, about the issue. The rise in in vitro fertilization points to the deferred dreams of many parents who long wanted a second child, but were prevented by a strict population control policy in place for more than 30 years. That, in turn, is shifting prevailing attitudes in China regarding fertility treatments - formerly a matter of such sensitivity that couples were reluctant to tell even their parents or other family members that they were having trouble conceiving. "More and more women are coming to ask to have their second child," said Dr. Liu Jiaen, who runs a private hospital in Beijing treating infertility through IVF, in which an egg and sperm are combined in a laboratory dish and the resulting embryo transferred to a woman's uterus. Liu estimated that the numbers of women coming to him for IVF had risen by 20 percent since the relaxation of the policy, which came into effect at the start of the year. Before, the average age of his patients was about 35. Now most of them are older than 40 and some of the women are fast approaching 50, he said. "They have a very low chance to get pregnant so they are in a hurry. They really want to have a child as soon as possible," he said. Chen Yun is 39 and was in the hospital waiting to have the procedure for the first time. She and her husband already have a 7-year-old son and their families are encouraging them to have a second child. "We are coming to the end of our childbearing years. It may be difficult for me to get pregnant naturally because my husband's sperm may have a problem, so we want to resolve this problem through IVF," she said. Chen said she hoped having a brother or sister would make their son happier, more responsible and less self-absorbed. "We had siblings when we were children. I had a younger sister and we felt very happy when playing together," she said. "Now that every couple has one child, two generations - parents and grandparents - take care of the child. They give the only child too much attention." If her son has a younger brother or sister to look out for, he may not "think too much about himself like a little emperor," Chen said. Over the past two decades, IVF technology has developed rapidly in China, where about 10 percent of couples are estimated to need the procedure to conceive. In 2014, 700,000 women had IVF treatments, according to the health commission's Women's and Children's Department, which said in a statement that demand for all types of fertility treatment had risen following the policy relaxation, including the use of traditional Chinese medicine. "Currently, fertility centers at renowned medical organizations in Beijing and Shanghai and others are under increased pressure for treatments," the department said. Previously, China limited most urban couples to one child and rural couples to two if their first was a girl. There were exceptions for ethnic minorities, and city dwellers could break the policy if they were willing to pay a fee calculated at several times a household's annual income. 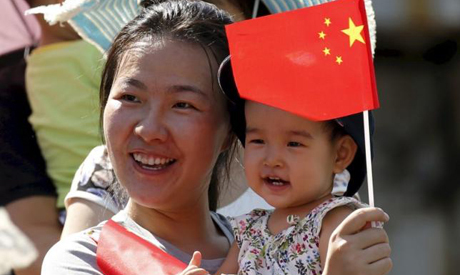 While authorities credit the policy introduced in 1979 with preventing 400 million extra births, many demographers argue the fertility rate would have fallen anyway as China's economy developed and education levels rose. Intended to curb a surging population, the policy has been blamed for skewing China's demographics by reducing the size of the future workforce at a time when children and society face increasing demands from the growing ranks of the elderly. It also inflated the ratio of boys to girls as female fetuses were selectively aborted, while compelling many women to have forced abortions or give up their second children for adoption, leaving many families devastated. The National Health and Family Planning Commission said in November that 90 million women would become eligible to have a second child following the policy change. Authorities expect that will add 30 million people to the country's labor force by 2050. Those projections could be overly optimistic since many younger Chinese see small families as ideal and would be reluctant to take on the cost of raising a second child. When the policy was changed in 2013 to allow two children for families in which at least one parent was an only child, it spurred fewer births than authorities expected. Also under pressure are China's sperm banks, which already suffer shortages owing to a reluctance to donate among young Chinese men unwilling to father children they won't know or fearing their offspring may turn up at their door one day despite donor confidentiality. "The relaxing of the one-child policy certainly gave an impetus to the demand for sperm as more women, usually aged around or above 35, came for assistance," said Zhang Xinzong, director of the Guangdong Sperm Bank in southern China. Calls have also gone out for a loosening of China's adoption law, which currently states that only couples with no children can adopt, while also allowing couples with one child to adopt a disabled child or an orphan.